SaloneSatellite, which runs concurrently to the Salone del Mobile and Milan Design Week, was the first event to focus on young designers, has become the unrivaled place for interfacing between manufacturers, talent scouts and the most promising young designers. Satellite is always my first stop when I visit the monstrous Fiera Rho on the outskirts of Milan, home of the furniture fair now for over 10 years. The inspiration, the conversations, the energy, and the fact that everyone showing there has been selected, none are over 35, and none are allowed to show there more than twice, make it a completely unique opportunity to meet the next generations of designers from around the world. To show at Satellite your submission is juried by a panel of architects, designers, journalists and manufacturers. Submissions are due in August the year before the show. Want to be part of it? Click here. Volis is an old French word that describes a tree ravaged by the elements. VOLIS is a unique project in Switzerland joining man and nature in harmonious creations that celebrate the interplay between color and materials. Swiss cabinetmaker Romain Luppi of Atelier Insolite, is passionate about wood in all its forms. He scours forests for dead wood that has been patiently shaped by natural elements, insects and time. Two years of research and testing have enabled Romain to achieve extraordinary results. Thanks to the use of ecological composite products – an organic bioresin to which he adds colored pigments – the timeworn stumps he finds in his own region become magnificent pieces of furniture. Not only does this subtle combination of gracefulness and depth allow preservation of the wood; it gives it a new life. Both materials blend perfectly and the wood shows off its luminous and vibrant shades. “Rust Harvest” is an experimental materials project by Studio Yuma Kano focused on the beauty of rust. The prevention of rust is an age-old problem in manufacturing. Rust has brought down planes, slowed ships, disabled engines, ruined bridges, spread through reinforced concrete, jammed guns, broken washing machines, and reduced unnumbered bicycles to useless scrap. While constantly cast as a devil, a closer look at rust reveals a variety of startlingly beautiful patterns and complex mixtures of color. With this in mind, we believed that the attractive expressions of rust could be produced in quantity and used in new textures and products. “My studio is in a shipyard, so I’m naturally surrounded by rust!” says designer Yumo Kano. “Most people think of it as a negative material, but I thought I would try to find the good in it. It’s actually a natural material, in that you can’t really control how it will looks, and you can’t reproduce an exact look. It depends on the seasons, the weather, the temperatures. “Through trial and error, we were able to develop a technique that allowed us to transfer only the rust from metal plates using acrylic resin. We expose these plates to light, rain, soil and seawater to create rust, collect the rust, and then subject the plates to more weathering, which creates another crop to harvest in a process similar to an agricultural cycle. “Adding parts of the metals the rust came from – iron for red, copper for blue – lets the user compare it to its original form. The metal is left untreated, giving it a raw look. After years have passed they should look like the material within the acrylic. Tianyi Shi wants you to know what’s underneath. 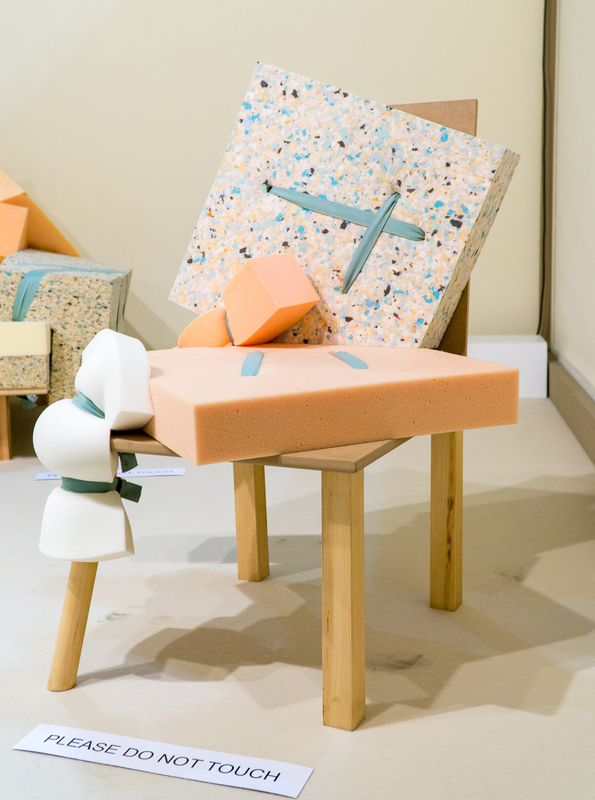 Shi’s graduate project while a student at London’s Central Saint Martins College of Arts and Design was an experiment in the deconstruction of everyday furniture, with a particular focus on the meat of the matter: foam. At first, Shi’s pieces look a bit like move-in day meets Star Trek transporter malfunction. The essential DNA of familiar pieces of furniture have been radically altered, yet they still serve their designed purpose. And even though we weren’t allowed to sit on them during the Milan fair, she assures us they’re quite comfortable. The lesson: Raw foam has its own beauty and doesn’t require being skinned with upholstery to create comfortable furniture. ...more coming, come back soon!